Loose skin of the face and neck is a common concern for patients. Jowls, excess skin at the jawline, and crepe-like skin of the neck can give the appearance of aging. SkinCare Physicians is at the cutting edge of non-surgical skin tightening, offering several options to dramatically improve the appearance of loose skin without surgery. The most useful procedures for skin tightening are based on delivery of radiofrequency energy. Thermage, Pellevé and Infini all utilize the concept that when collagen is heated uniformly and intensely by radiofrequency, it undergoes contraction and induces a healing response. New collagen is produced which then leads to tightening of loose skin. While some patients notice improvement immediately, all of these devices will lead to continued improvement over a 4-6 month period. Most importantly, they all allow patients to gain skin tightening while avoiding invasive surgical procedures. Thermage is most helpful for skin tightening at the cheeks, jawline, and upper neck, but can be used safely and effectively on the forehead, the eyebrow, as well as the arms, legs and abdomen. 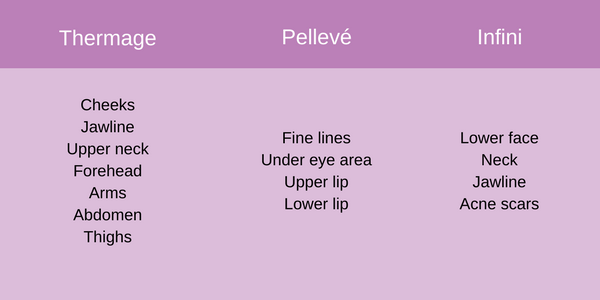 Pellevé is specifically designed for fine lines and crow’s feet around the eyes, and our physicians have also discovered its usefulness for wrinkles of the upper and lower lips. Infini is especially beneficial for jawline, cheek and neck laxity. Infini can also be used to improve acne scarring. SkinCare Physicians has been integral to the development of skin tightening technology, and our physicians have invented and helped teach the most up-to-date techniques used for these procedures. Thermage is a very operator-dependent procedure and it is essential for patients to be treated with the most up-to-date techniques to achieve maximal results. This is what we believe separates SkinCare Physicians from other practices that perform Thermage. Since approaches to treatment and technology are evolving rapidly, SkinCare Physicians is uniquely positioned to allow our patients to quickly take advantage of these advancements. In fact, our doctors have discovered many of the Thermage advances now used around the world. Most recently, Thermage has become even better with the introduction of the brand new Thermage FLX machine. SkinCare Physicians is one of the first two practices in the United States to have this exciting new cutting-edge technology. Our physicians have developed techniques that make Thermage almost pain free. Generally, patients feel a gentle, warm sensation when this device is applied to the surface of the skin. The procedure visit requires approximately one hour, or 35 minutes with Thermage FLX, and usually only one treatment is necessary. Maximum results are attained by repeating Thermage every 2-3 years. Results can be seen immediately in some cases but skin tightening continues to occur for approximately six months, which is when optimal results are seen. Some patients experience mild redness after treatment but this disappears within hours. Bruising and pain are very uncommon and there is essentially no ‘down time’ following Thermage. Thermage is extremely safe. The number of adverse effects is extraordinarily small, and with the introduction of modified treatment guidelines in 2005 for Thermage, the number of adverse events has dropped to less than 0.1%. Pellevé is similar to Thermage in that it is non-invasive and based on a radiofrequency device that is applied to the surface of the skin. It was specifically designed to treat those annoying fine lines and small wrinkles around the lower part of eyes. However, SkinCare Physicians providers have discovered that it can be very useful for upper and lower lip lines as well. The benefit of Pellevé is that each procedure can be done conveniently in approximately 15-20 minutes and it requires only 3-4 treatments spaced monthly for best results. Patients experience a warm sensation when Pellevé is applied to the skin, and mild redness from the procedure usually fades within minutes to hours. Infini leads to outstanding tightening when used on the lower face and neck, and sharpens and better defines the jawline. It has also been shown to improve the appearance of facial acne scars. Infini delivers heat through tiny insulated microneedles. The Infini procedure is done over the course of one hour. In order to make our patients as comfortable as possible, a topical anesthetic gel is applied to the skin for up to 90 minutes prior to treatment, making the entire visit approximately 2-3 hours in duration. Patients can expect to experience 3-5 days of redness and mild swelling following the Infini treatment. Since makeup can be applied 24 hours after the procedure, it is an easy procedure to incorporate into a busy schedule. Maximum results are achieved when patients plan 2-3 treatments, which are done on a monthly basis. Results can be seen as early as one month, but skin continues to tighten for 3-6 months after treatment. Learn more about our skin tightening procedures from the answers to these frequently asked questions. Are Thermage, Pellevé and Infini procedures painful? Each pulse of the machine produces a sensation of heat in the area. Fortunately, this heat sensation lasts only a fraction of a second. The popular misconception is that Thermage, Pellevé and Infini hurt a lot. They do not. Our physicians have developed many new techniques that have virtually eliminated pain with these procedures. How long will these skin tightening procedures take? The Thermage and Infini procedures themselves may take anywhere from 45 to 90 minutes depending on the size of the area being treated. But with the application of the anesthetic gel for Infini, the visit will take about 2 to 3 hours. The Thermage FLX last about 35 minutes. Pellevé can be performed in 15 to 20 minutes. Do I need special preparation? You may continue to use your topical creams and any oral medications up until the time of the procedure. Please avoid wearing jewelry and makeup on the day of your appointment. There is no “down time” with Thermage and Pellevé. Redness is seen in some patients, but it disappears within a few hours. Swelling, particularly along the jaw line, is often subtle and usually resolves within a few days. Bruising and pain are uncommon after the procedure. There is no special care needed afterwards. With Infini, 3-5 days of redness and mild swelling are common, but makeup can be applied as soon as 24 hours after the treatment. When will the results show? Although some improvement is seen immediately in most patients, results will continue to improve gradually over the next 4 to 6 months. Since the effects are so gradual, the patient may not be aware of the extent of the improvement. Photographic comparison with pre-operative pictures can in some instances demonstrate the difference. How many skin tightening treatments will I need? For many patients one Thermage or Thermage FLX treatment will suffice. Repeat treatments may be needed for others. Pellevé usually requires three treatments. With Infini, maximum results are achieved when patients plan 2-3 treatments, which are done on a monthly basis. A decision regarding further treatment can be made as early as one month; however, since benefits are delayed, further treatment usually does not begin for 4-6 months. Most patients repeat treatments every 2 to 4 years. Recent data suggests that treatment at one to two-year intervals can induce profound improvement that is superior to waiting longer. In some studies the results have lasted over five years, but treatment at 2 to 3 year intervals appears to maximize improvement. Recent data based on research led by SkinCare Physicians confirms that Thermage produces noticeable results in over 94% of patients treated. At SkinCare Physicians, our doctors and staff are highly experienced with skin rejuvenation technologies, including Thermage, Pelleve and Infini. Get started when you request a consultation online to come visit with us.